36-38 (S) may be changed by changing the thickness of the yarn. In order to increase the size, it is possible to use a thicker yarn and larger needles. 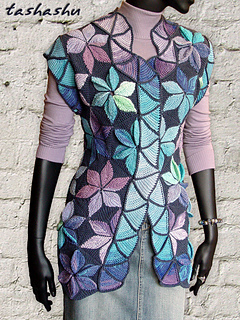 Besides the indicated yarn that the sample was knit with, this motif may be worked from any other yarn weight as well. The thinner the yarn, the smaller the resulting hexagon; the thicker the yarn, the larger the hexagon. Size one hexagon: width - 13.5 cm, height - 15 cm. Yarn: Alize Bahar (100 g/260 m) for this size: 650 g.
Yarn A - main color, yarn B - flower color. Gauge: 26 sts and 34 rows = 10 cm х 10 cm.